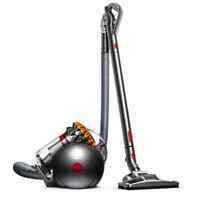 Official Dyson eBay store. 2 Year Warranty. Immediate payment of AU $599.00 is required. A1 service from start to finish. Very happy with purchase. Terrible. 12 days after purchase item was still not shipped. Full refund given. Couldn’t get a proper tracking number even requested. Bought multiple vacuums. One of the delivered items (box)was not factory sealed. Why don't you send $350 product in a mailing box? Now the box is damaged. The V7 is my first Dyson, and I am both highly impressed and highly disappointed - if that's possible. It has great suction and works far better than I expected on carpet. I expected it to be great on our hard floors but not have the power required to do a decent job on carpet, but I was pleasantly surprised! But wow is it disappointing on hard floors! It picks up very small debris brilliantly, but anything bigger than dust is likely to be flicked all over the floor by its rotating motorised head. Dyson do not make a hard floor tool for the V7, but fortunately, V8 attachments fit the V7. So if you can get your hands on the Soft Roller Head from the V8, you'll be happy. 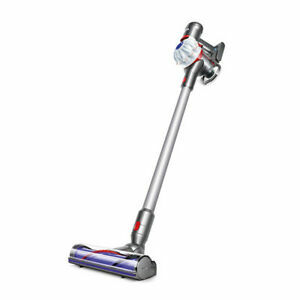 I contacted Dyson and they were very understanding (after some firm words) and sold me a V8 Soft Roller Head for $130. Might have been better getting the V8... All of that said, I very rarely use my corded vacuum now, and will absolutely be buying another Dyson whenever this one meets its end! Light, motorized head glides over thickest carpet easily. Runs quieter than my old corded vacuum. 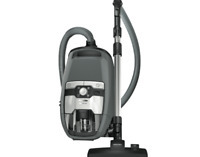 Amazing suction, great performance and empties dust contents in seconds. Very happy with V6 and I highly recommend Dyson. Very quiet and easy to use hand held vacuum cleaner. Very easy to use. Has good suction when it is in normal mode. A lot quieter than my older model that still goes well. A little bit hard to empty the first time till get used to it. Overall I am very impressed with it. I like how it finds extra dirt on clean looking carpets also the clear dirt container is cool you can see the amount of dirt it picks up. Thank you i love using it.